Designer pet purses, totes, bicycle baskets and other carriers to travel with small to medium dogs, cats and small pets. Travel in style with this roller bag/backpack/car seat pet carrier combo. Airline approved. A chic designer dog or cat carrier with leather trim. Airline approved. 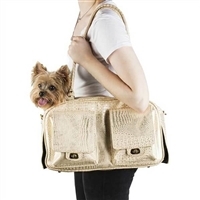 A small dog purse-style carrier with gold plated hardware. Airline approved. A super stylish dog tote made with genuine Woolrich buffalo plaid wool. Airline approved. A dog carrier for your bicycle that folds and collapses - fun for travel, perfect for storage. High quality canvas pet carriers with leather straps for pets up to 20 lbs. High quality canvas pet carriers for pets up to 20 lbs. A high quality faux leather pet carrier in brown or black. A gorgeous designer dog purse covered in crystals. A genuine leather designer dog purse available in 5 colors. Airline approved. For health, hygiene and safety reasons, bags, carriers and totes may not be returned or exchanged. Find the best dog and cat carriers, purses and totes for travelling by car, plane, or bicycle with your very best friend. Fashionable, airline compliant dog and cat carriers for in-cabin air travel, bicycle baskets for 2 wheeled travel. Pet carriers can also keep your pet safe when riding in the car as they will buckle into the seat belt. Whether to the park, across town or around the world, rest assured that your pet will travel safely and in style with our designer pet carriers, purses and totes from Snooty Pooch Boutique. Flying with your dog: Many airlines will let you to take your small dog with you onboard the plane. Check Ahead- Each airline has different requirements. Check each airline to see what flight is the best fit for you and your dog. Getting Ready– Even if your pet is use to being in a crate, they may not be as comfortable in the smaller crates that most airlines require. Buy the crate that you will use at least 3 to 4 weeks before your trip. Get your pet used to the crate by having them eat and sleep in it. Pack a bag for your dog - include a copy of their vaccines records, medication, food, treats, and a favorite toy. Make sure that the information on their ID tag and microchip are up to date. Airport Etiquette- Pets should fast 4-6 hours before a flight and go to the bathroom before entering the airport. If you have a multi-leg flight, check ahead to see if the airports you are traveling to have potty areas and where they are located. Airport Security - All pets will need to be taken out of their carrier and carried through security. Make it easy for yourself by removing their harness and collar before walking through the metal detector. Flying- Your pet must stay in the carrier throughout the flight and under the seat in front of you. To help your pet feel comfortable, board the plane as early as possible and hold the carrier on your lap facing the window so your pet can relax. Give your pet some treats to calm any nerves throughout the flight. A window seat is also best because you can face your pet towards a wall.